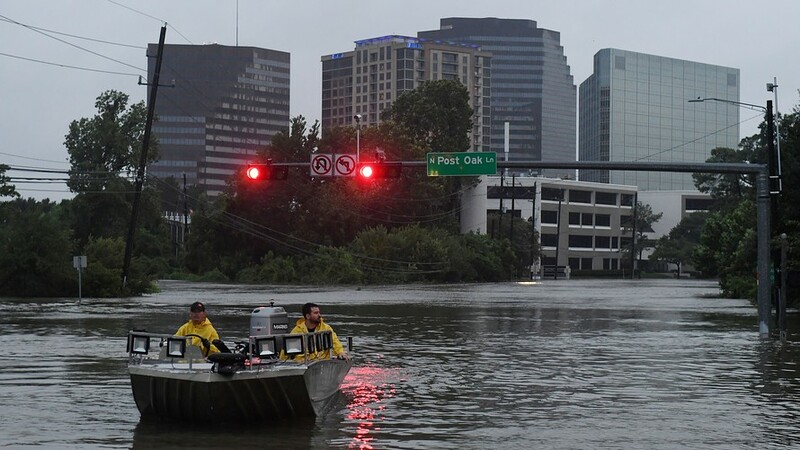 Deadly Hurricane Harvey struck at the heart of the U.S. oil industry over the weekend, and the effects of the powerful storm and its floodwaters are likely to ripple across the sector for weeks to come. Energy stocks were the biggest decliners in the S&P 500 index on Monday as the aftermath of the Category 4 hurricane continued to create destruction across a swath of Texas, with at least five people dead, thousands of residents displaced, and scores injured after the floodwaters rose. Shares of refiners were the exception. Refineries in the areas affected by the hurricane will likely be sidelined for weeks, and gasoline futures spiked. Downtime is a negative for the refining industry, but better margins would more than compensate for the effect. Shares of refiners that operate mostly outside the Southeast jumped the most, with stock of Delek U.S. Holdings Inc. DK, +8.79% PBF Energy Inc. PBF, +8.30% and HollyFrontier Corp. HFC, +6.46% all surging more than 7%. These would be best positioned given the widening crude differentials and their unaffected operations, analysts at Raymond James said in a note. “If product flow from the Gulf Coast to the East Coast is disrupted, PBF Energy may see benefits given its relative overweight position in the northeast,” they said. Exploration and production companies with more exposure to Texan oil basins will likely feel the lingering impact from Harvey the most, said Brian Youngberg, an analyst with Edward Jones. Stock of sizable Permian operators including Anadarko Petroleum Corp.APC, -2.57% and Apache Corp. APA, -1.77% fell the most. Anadarko was down 3.4%, while Apache slid 2.8%. For those companies, their operations will be hurt and they will have fewer outlets for their oil. As long as the refineries are down, E&P companies will see their inventories rise, said Youngberg. Shares of giants such as Exxon Mobil Corp. XOM, -0.33% and Chevron Corp.CVX, -0.43% held up better, as they have oil and gas fields all around the world. Refineries could be down for days, analysts agreed. Even if they were able to operate normally during heavy flooding, staffing will be an issue with so many people affected by the storm and unable to come to work, Youngberg said. Supply disruptions and delays are also a concern, analysts at Tudor Pickering Holt said in a note. “This is a fluid situation and system downtime will be dependent on damage to the plants and supporting infrastructure, but we guess that the supply disruption will be in the one to two-week range at this point,” the analysts said. “Refiner equities could outperform heading into this week as a result, but frankly we see a call on stocks as a secondary issue given the magnitude of the situation. Analysts at Goldman Sachs said limited data available amid the havoc points to “sizably larger refining than production disruptions.” Using past hurricanes as proxies for the impact on oil demand, they estimated that the impact of Harvey on the U.S. oil market would be to increase domestic crude availability by 1.4 million barrels a day while removing 615,000 to 785,000 barrels a day of gasoline and 700,000 barrels a day of distillate supplies. “Larger refinery outages would increase these long crude and short product impacts,” the analysts said. The Energy Select Sector SPDR exchange-traded fund XLE, -0.44% was down 0.7% and has lost 17% in 2017, while the S&P 500 SPX, +0.05% has gained 9%.